This year GBK luxury Lounge pours 24k Gold Blue Nun in honor of 75th Annual Golden Globe Awards. Beverly Hills (Spiritsman) 1/8/18/–This year in honor of Golden Globes 75th anniversary GBK luxury lounge was held at the Montage Beverly Hills Hotel the presenting sponsor 24k- Blue Nun founded in 1789 Langguth Erben, is a family owned winery located in Mosel region of Germany run by the 7th generation Patrick Langguth. 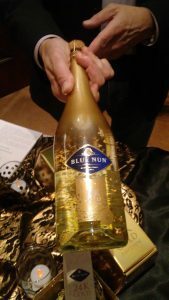 Gifting the Blue Nun 24k gold edition this sparkling wine from Germany is slightly sweet refreshing and contains real 24K flakes. The 24K Gold Edition is a great aperitif its effervescence comes from an old fermentation process to highlight the natural bubbles, they also add genuine approved real 24k gold flakes. 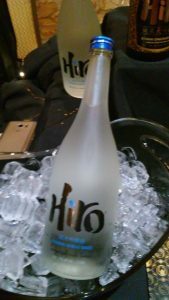 Its great for celebrations like Golden Globes. Moraga Vineyards is privately owned by Rupert Murdock and proud to be the local wine for Los Angeles, located in Bel Air, California on Moraga Drive. This private local wine growing estate is located right in the Santa Monica Mountains at an elevation of 600 to 900 feet, five miles from the Pacific Ocean . Moraga Red Wine is one of there most popular produced from a blend of Cabernet Sauvignon and Merlot with a small amount of Cabernet Franc and Petit Verdot. Each lot is gently de-stemmed and lightly crushed directly into one-ton stainless steel open-top fermenters with complete temperature control. Actress Elizabeth Daily From Emoji Movie. & Avengers as Moonstone Sips Wine fron local Bel Air, CA Moraga Vineyard at GBK GG luxury lounge 2018, This year GBK luxury Lounge pours 24k Gold Blue Nun in honor of 75th Annual Golden Globe Awards. permalink.